The BC 26 Series Outback, designed for cutting tough overgrown brush, is ideal for cleaning meadows and fields, or cutting paths and trails - wherever dense brush and weeds present a clean-up challenge. 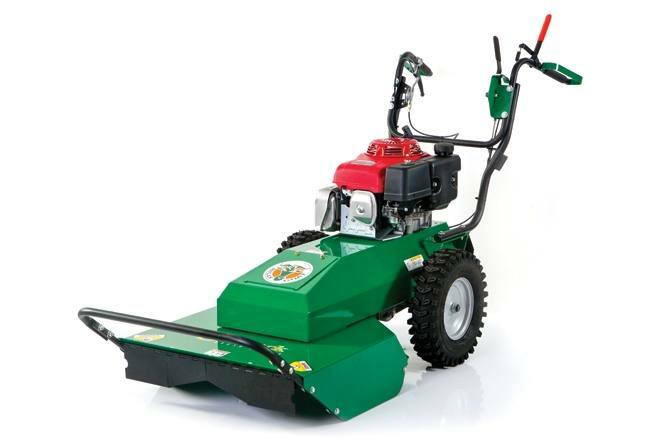 The 26" wide rigid deck commercial-duty brush hog provides excellent stability in deep vegetation. The heavy-duty blade spindle is reinforced on four sides to tackle the toughest cutting conditions, including thick brush up to 6' high, grass and weeds over 8' tall, and saplings up to 2.0" diameter. The heavy-duty mechanical transaxle, featuring three speeds and reverse, combines the transmission and differential into one sealed package with no linkages to snag on brush. BC2600 Heavy Duty Blade Spindle: Reinforced in four directions for maximum durability and safety, so you can keep cutting in the harshest conditions. Rigid Deck: Does not articulate and pull, snag on hills, holes or uneven ground. Provides excellent stability in deep vegetation. Heavy-Duty Mechanical Transaxle: Combines the transmission and differential into one sealed package with no linkages to snag on brush. Three speeds and reverse. Intuitive Drive Controls & Handles with Padded Grips: Best in class control package allows the user to feather in forward and reverse directly from the handles - no shifting required. Rubberized Rear Deck Trim: Allows for easier stump clearance in reverse.